This morning temperature was 2 degrees. Thank goodness it's Friday and I don't have any special plans for this morning. It is brutal outside. And I think last couple of weeks, it snowed at least twice every week. I am so over winter, like everyone else around here. Usually, I get excited for winter just around November because of holidays and as soon as new year's day comes, I am over it. Taking down holiday decorations is the hardest part and as I do it, I start to feel like, Okay, I am over winter. But of course that doesn't change anything for another couple of months. And now I'm at this stage, longing for spring every single day. Let's face it, wishing it's spring is not going to do anything. At least "cooking cold weather friendly meals" make me feel better. 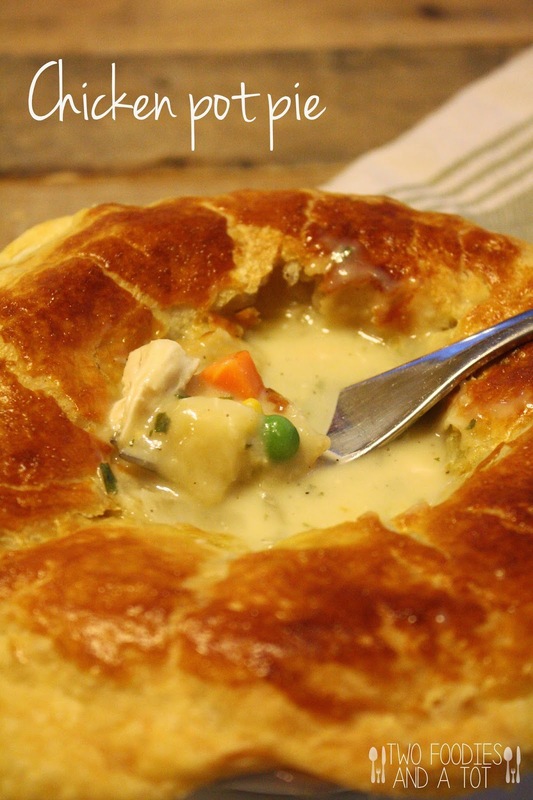 We love good chicken pot pie. 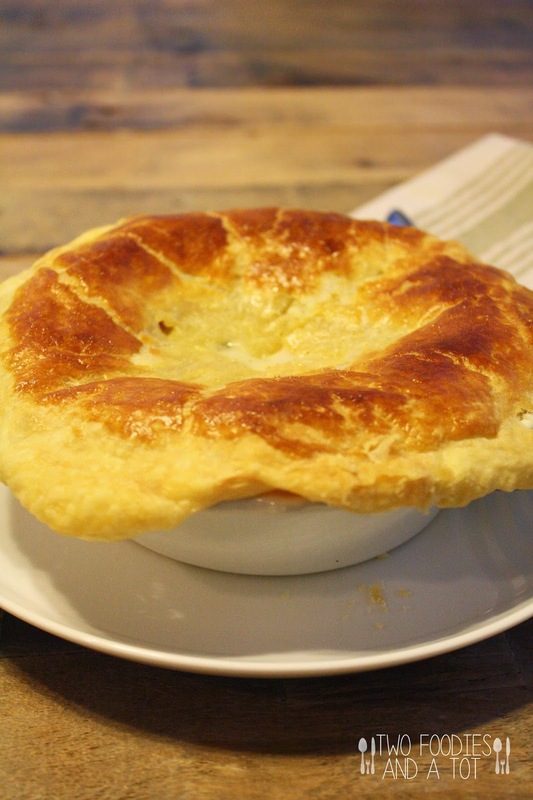 Call me crazy, I used to not like pot pie until I met Steve. He likes pot pie so much, I started to make it and I grew to like it. It's so simple but I changed it up here and there over the years and came to this simple recipe. In fact, my mother in law asked me to make some and sell them at her senior community. Haha. That's sweet of her that she loves my pot pies so much but well..it's illegal here to sell home-cooked meals unless I cooked it at a licensed facility anyway. I had some leftover pastry dough and I rolled it out and made quick cinnamon sugar palmier pops. My tot's face lights up as soon as he sees anything on a stick. I didn't get to take pictures as we made it after dinner and made a big mess but they're so darn cute. Should have made them for Valentine's day. Even though it means elephant ear, it looks more like a heart to me. Roll out the dough into rectangle as you made the dough initially and brush little butter and sprinkle cinnamon sugar, fold each end quarter to the middle and fold again like a book. Cut them to about 1/2 inch slices and poke a stick through it if you're making pops otherwise just bake at 375F for 15 minutes or until golden brown. 1. Make the pastry(if you're using store bought puff pastry or pie dough, skip this step). In a food processor, add flour, salt and add butter. Pulse until the crumbs are pea size. Slowly add water to it and pulse until just it just come together. On a floured surface, place the dough and using a floured rolling pin, roll it out into a rectangle. Fold bottom third to the middle and upper third to the middle, like a letter. Roll it out and fold again, repeat about 6-7 times. Chill in the fridge for an hour(or over night). 2. In a large skillet, melt the butter and saute diced onion until just translucent. Add flour and cook it for 2-3 minutes while stirring constantly so the roux doesn't burn. 3. Add chicken stock and whisk until well mixed. Let it thicken and season with salt and pepper. Add cream or half and half, if using. Add vegetables, chicken and pearl onions and mix well. 4. Preheat the oven to 375F. Scoop pot pie filling in the vessel you're using. I like individual bowls. Take out the pastry dough from the fridge and roll it out and cut to size. Brush the edge of the bowl with egg wash and cover with the pastry. Brush the top with the egg wash too and make little slits. Bake for 35-40 minutes or until pastry's golden brown and ready. * Pastry recipe from Dessert for two. I think this is a great recipe for me to make thanks!